Schlock-Wire: MANIAC COP 2 Returning To Theaters And Debuting On Blu-Ray Alongside MANIAC COP 3 – Schlockmania! October 17, 2013 (LOS ANGELES) — Blue Underground is bringing a 2013 DCP Restoration of director William Lustig’s MANIAC COP 2 to theaters this fall in advance of its upcoming Collector’s Edition Blu-ray Combo Pack release. 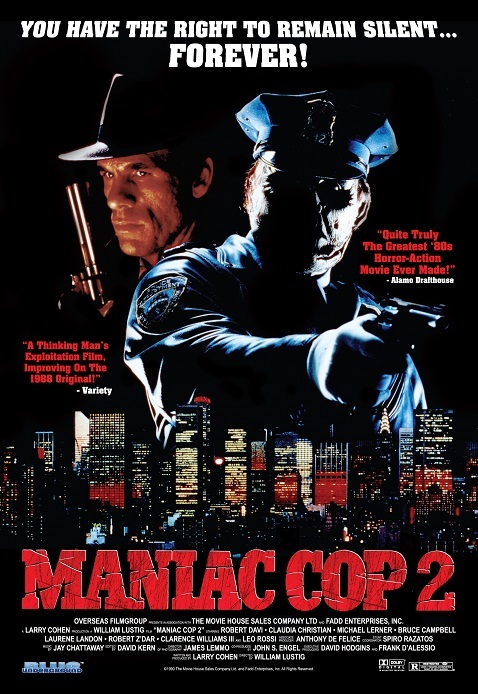 Featuring a brand-new 4K High Definition transfer from the original camera negative and new Dolby Digital 5.1 mix, this MANIAC COP 2 DCP is the definitive presentation of the action-packed cult-horror favorite. Bill will attend MANIAC COP 2 screenings in New York, Los Angeles, Boston, and other select cities (TBA) to introduce what critics have hailed as “Truly The Greatest ‘80s Horror-Action Movie Ever Made!” (Alamo Drafthouse). In MANIAC COP 2, Officer Matt Cordell is back from the dead and stalking the streets of New York once more. Cordell was once a hero, but after being framed by corrupt superiors and brutally assaulted in prison, he sets out on a macabre mission of vengeance, teaming up with a vicious serial killer to track down those that wronged him and make them pay… with their lives! Scripted by Larry Cohen (IT’S ALIVE), MANIAC COP 2 boasts an amazing cast including Robert Davi (LICENSE TO KILL), Claudia Christian (THE HIDDEN), Michael Lerner (BARTON FINK), Laurene Landon (HUNDRA), Leo Rossi (HALLOWEEN II), Robert Z’Dar (TANGO & CASH), Charles Napier (THE SILENCE OF THE LAMBS), and Bruce Campbell (THE EVIL DEAD). Blue Underground’s MANIAC COP 2 Collector’s Edition Blu-ray Combo Pack arrives on November 19, 2013. Visit us on Facebook at https://www.facebook.com/pages/Blue-Underground/117400280148. Q&A with Director William Lustig & Special Guests TBA! Q&A with Director William Lustig!